If you’ve carved out time to visit Seoul, there’s no way you should leave Namdaemun Market out of your Seoul itinerary. With a footprint dating as far back as the Joseon Dynasty when King Taesong built shops around Namdaemun Gate, this bustling marketplace is the largest of its kind in Korea. Since the market’s “official” opening in 1964, it’s blossomed into over 10,000 shops lining the streets, alleyways, and buildings around its namesake ancient gate. 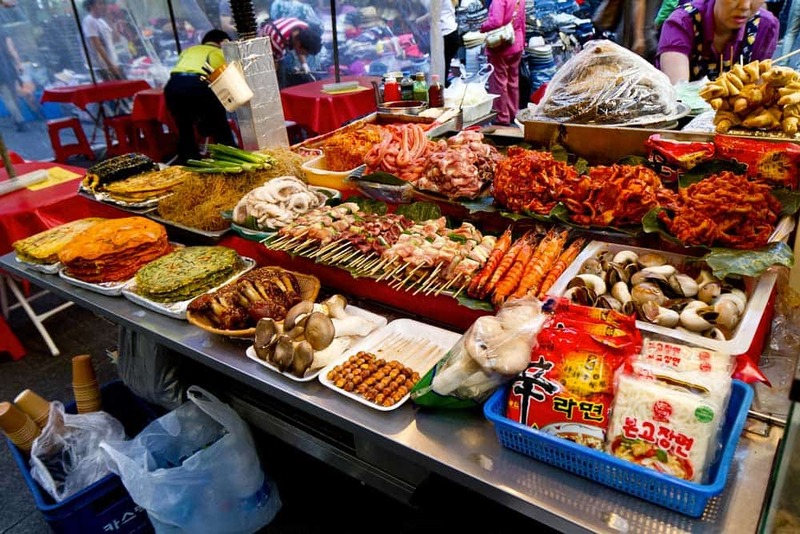 So, what types of things will travellers find at Namdaemun Market? In short: Everything. 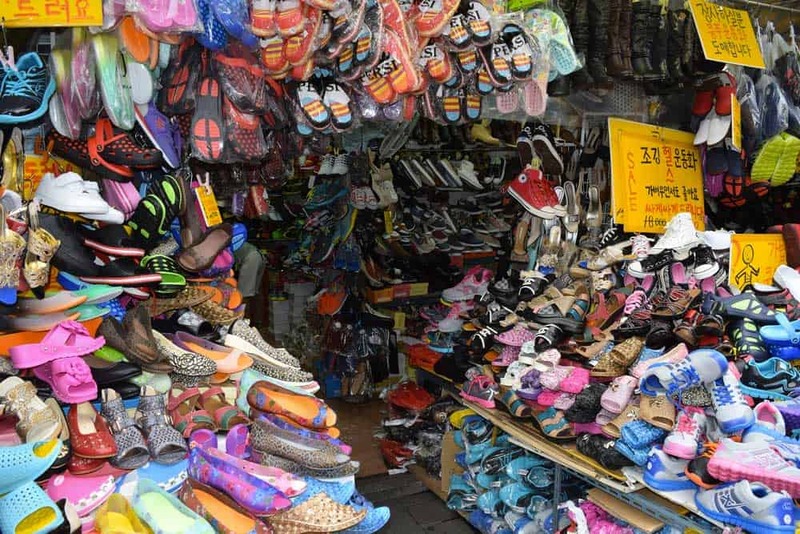 Whether you’re looking for souvenirs, household goods, sporting equipment, herbs, fashion accessories or kids’ toys, you’ll run into it at Namdaemun Market. Several times over. With vendors vying for your won in every direction, you can bet that Namdaemun Market is one of the best places in Seoul to secure a bargain. Sharpen your haggling skills as you move from store to store, sorting through anything you might desire—whether at the moment it’s traditional Chinese medicine or a pair of hiking shoes. And lest we forget the big reason that many people visit this top-rated Seoul attraction: food. Mandu: Korea’s answer to Chinese xiaolongbao, these silky smooth dumplings are one of the best snacks on the planet, not just in Seoul or Korea. The popular Gamekol Son Wangmandu, a few doors down from Gate 5, is one of the best places for mandu in Namdaemun Market. Try their kimchi mandu for a uniquely Korean spin on Asian dumplings! Kalguksu: Of all the specialty foods in Namdaemun Market, perhaps none is more famous than kalgusku, a Korean soup based on a hearty seafood broth and topped with hand-cut wheat noodles. There’s an entire street within the market dedicated to it (Kalguksu Alley), sitting just inside Gate 5. Eomuk: Found in food stalls all over Korean, these fishcakes are a staple at Namdaemun Market. The most popular variety here is served on skewers with a savoury mixture of soy and chilli. Hotteok: A Korean street food favourite, these pancakes come stuffed with a variety of ingredients ranging from sweet to savoury. The food cart near Gate 2 is one of the most famous places to grab hotteok in Seoul. Their speciality, a savoury hotteok filled with japchae (glass noodles seasoned with sesame oil and soy sauce) and vegetables like carrots and spinach and pan-fried to perfection, is a must-eat food in Seoul! Tteokbokki: One of the most popular street foods in Korea, these silky rice cakes, featuring a texture quite similar to gnocchi, are pan-fried with a spicy gochujang-based sauce that’s both a tad spicy and sweet. Tmark Grand Hotel Myeongdong: A classy central hotel that’s high on style without breaking the bank. Rooms are spacious, quiet, and affixed with modern furnishings. Views unto Namsan from the hotel and select rooms are simply wonderful. Courtyard by Marriott Seoul Namdaemun: One of the top mid-range luxury hotels in Seoul, this lovely property delivers on clean contemporary rooms, all proudly boasting massive city views. Get the best price guaranteed and collect Marriott Rewards on your stay by booking directly at Marriott.com. Aloft Myeongdong: An ultra-hip design-style hotel from one of the hippest and fastest-growing chains on the planet. From the rooms to the trendy on-site W XYZ bar&lounge, this sleek luxury hotel will delight you with its colourful post-modern motifs. The Westin Chosun Hotel Seoul: Easily one of the best luxury hotels in Seoul, this decadent 5-star furnishes a world-class accommodations experience from check-in to check-out. All of the on-site amenities—from the palatial indoor pool to the well-equipped fitness centre—are absolutely divine. The easiest way to get to Namdaemun Market by public transportation in Seoul is via the subway. Scoot over to Hoehyeon Station on Line 4, using Exit 5 to get out to street level. The exit spits you out directly in front of one of the market’s main gates, just a short walk to many of its top food stalls and restaurants including the famous Kalguksu Alley.